This map is highlighted to give a retrospective view of the extent of Westminster. Represented in blue is the territory of Westminster according to the Decretal of AD1222 , while the red outline shows the present boundary. The green and yellow outlines indicate manor boundaries. Basire, J. The area shaded red represents the extent of Westminster as defined in the Letters Patent of 3 August 1604. Basire, J. An orange coloured area shows the extent of Westminster according to King Edgar's Charter of AD951. The contemporary boundary of Westminster is shown in red. 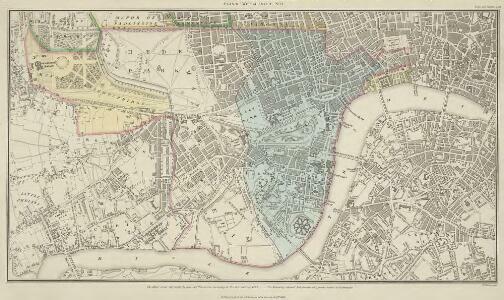 Basire, J.
MAP OF THE WESTERN SIDE OF LONDON, DISTINGUISHING THE ESTATE OF HER MAJESTY'S COMMISSIONERS FOR THE EXHIBITION OF 1851. MAP of the GROSVENOR ESTATE (tinted pink) as it was in the Year 1723. with the intended Streets about Grosvenor Square. 1 : 5592 The title of this plan features at top right, with compass star at middle right and explanatory note at bottom right. The boundaries of the St George parish are outlined in red, with the properties in the estate in pink, and parks and open spaces in green. The plan shows the proposed new street plans for Grosvenor Square, but not the Chelsea waterworks,which featured in the original drawing from which this print was produced. 1 : 3840 The title of this plan of Hanover Square and the Parish of St George appears with the publisher's imprint at lower right. Compass star and scale bars are featured at top left. The plan shows Buckingham Palace and additions made in the Regency period to the street plan. The Parish of St. George was established in 1725 and extended from Regent Street (then called Swallow Street) to the Serpentine, and from Oxford Street to include the whole of Mayfair, Belgravia and Pimlico. Ward, E. T.
A New PLAN of the CITY and LIBERTY of WESTMINSTER, Exhibiting all the New Streets & Roads, with the Residences of the Principal Nobility, Public Offices, &c. Not extant in any other Plan. 1 : 11520 The title of this map appears in cartouche at top right, with a compass rose at top left. A territory with its own courts and administration, the Duchy of Lancaster was created in 1267 by Edward III for his younger son John. The Duchy was attached to the Crown when Prince Henry of Bolingbroke, the last Duke of Lancaster, became Henry IV in 1399. To this day, the Duchy has retained its own jurisdiction under the Chancellor of the Duchy of Lancaster.The chancellorship is a high governmental position, and sometimes a cabinet poist. Since, for at least the last two centuries, the Chancellor rarely has had any significant duties pertaining to the Duchy's management, he is usually available as a minister without portfolio. Recent Chancellors have included Labour cabinet minister Mo Mowlam. A miniature map of London and Westminster with title at the foot of the plate and areas outside the built-up area coloured green. This engraved plan shows the road through Tutthill Fields in Westminster leading to the new bridge at Vauxhall.The plan's title features in banner at top left, with compass star at bottom right.The proposed new road stippled and highlighted in colour. This is a copy of part of the Faithorne map. It is an example of a bird's-eye (or 'plan') view. Crace often had copies made of maps if he was unable to procure an original. Description: This map is highlighted to give a retrospective view of the extent of Westminster. Represented in blue is the territory of Westminster according to the Decretal of AD1222 , while the red outline shows the present boundary. The green and yellow outlines indicate manor boundaries.